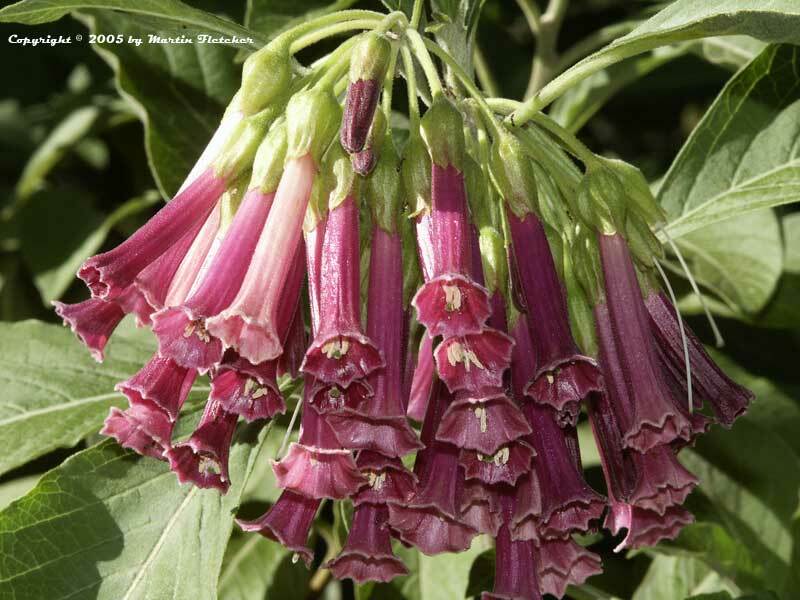 Iochroma cyaneum violacea is related to the tomato and potato, but more closely to the Trumpet Tree or Angels Trumpet. The plants are moderately hardy. Mine have withstood temperatures in the mid-twenties without damage, and without ceasing to bloom. Iochroma cyaneum is reportedly hardy down to 20° F, my plants have withstood 25° F and looked good. Shrubs get to 8 feet tall and wide and are nearly always in bloom. They are a great plant for attracting hummingbirds as I am sure you can imagine from the shape of their flowers. Violet flowers and foliage of Iochroma cyaneum violacea. High resolution photos are part of our garden image collection.